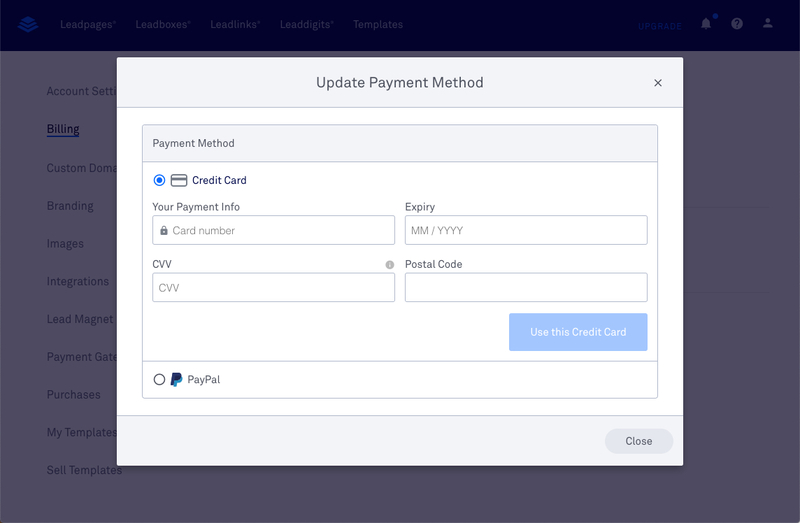 Got a new card or just need which card you use to pay for your Leadpages subscription? Good news, you can update this information right from within your Leadpages account! Check out the steps below for full details. Click the profile icon at the top-right corner of your dashboard and select "Account Settings". Click Billing on the left-hand sidebar. Click Update next to your card details. Fill out your updated payment information. Click here for accepted payment methods. That’s it! Your payment details are all up to date! If you’re updating your card information after a failed payment, please contact support to let us know you’ve added a new card to your account. You can upgrade your account at any time from your billing section. For a full guide on upgrading, please see our article here: How Do I Upgrade My Current Leadpages Plan? If you’d like to downgrade, please reach out to our support team so they can make sure your new plan is fully processed.